Our rainy season started the week before Christmas. Local weather reports predicted 7 days of rain, with 5 to 10 inches; an unusual storm system for our area. But, rather than lament the wet conditions and slippery roads homesteaders should rejoice in the ability to collect “free” water that can be used in the garden during times of limited rainfall. 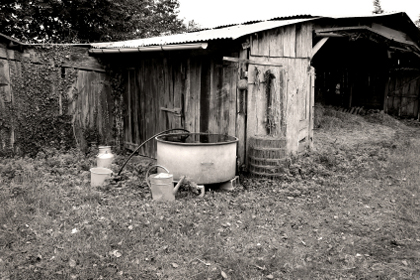 The collecting of rainwater is as old as time itself. Many ancient cultures collected and stored rainwater for use during drier months of the year. Did you know a single 20′ X 30′ roof can yield over 13,000 gallons of rainwater from one 10-inch rainstorm? If homeowners capture only a fraction of that, it’ll go a long way toward preserving a rapidly diminishing fresh water supply. This has been particularly important to me because our municipal water rates have gone up another 10%, making this increase the fourth this year. A local paper reported that our town’s water rates have increased 67% in the last 5 years and over 109% in the past ten years. Forget gold, folks – water will soon be the bankable commodity everyone is clamoring for. Several years ago I got serious about collecting rainwater. My system is simple yet very effective. A series of connected barrels line the north side of my house. A downspout is attached to the first barrel, which feeds all the others when it is full. When all barrels are full the downspout is moved, diverting the runoff away from the full barrels. I use recycled 55-gallon barrels that once held juice concentrate, which means they are food grade with no chance of having been exposed to chemicals or other harmful liquids. And, for the reasonable price of $35 each I can buy several for the same price as one expensive commercially sold system. With the step-by-step instructions and great photos, you’ll be collecting rainwater (and saving money) in no time. Now that’s what I call pennies from heaven.